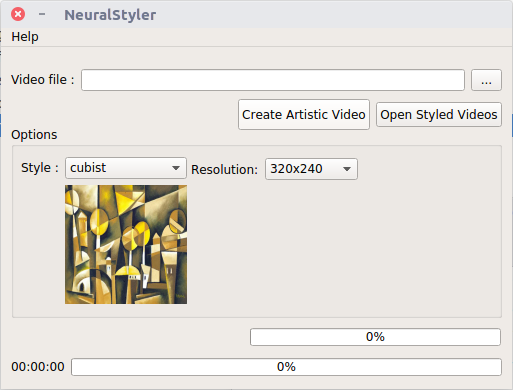 NeuralStyler is a free software for windows and linux and it converts your videos into art works. 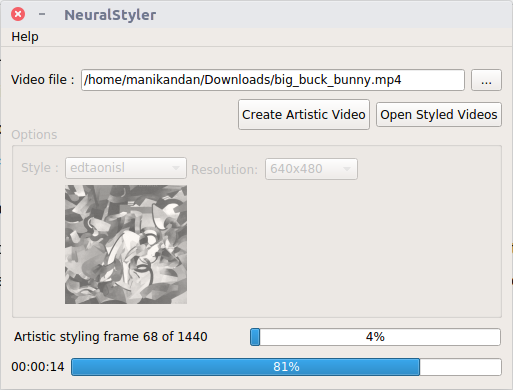 It uses Artificial Intelligence styling algorithm to convert the videos by using styles. It is available as Ubuntu14 64-bit portable package and Windows 64-bit portable package. The downloaded file size is nearly 135MB.No need to install, just extract the package and double click the program executable file. The program interface is very simple. It only has five UI element. like source video file selection, create artistic video button,open the styled videos folder and style and resolution selection. The convertion process is done by Offline and no need to upload your videos online. Currently there are 6 styles available.A preview pane below the drop-down menu let us see how the style we selected would appear. It also comes with five different resolutions options.